"Leading packets through your computer." 23 August, 2008 - Development version 1.1 has been released. This is simply a port from KDE 3 and C++ to Python and KDE 4. It should be fairly stable. Things like updating icons, .desktop files, documentation etc still need to be worked out. 11 November, 2003 - Stable version 1.0.0 is released. No big changes, I just finally got around to finishing off the manual. Enjoy. 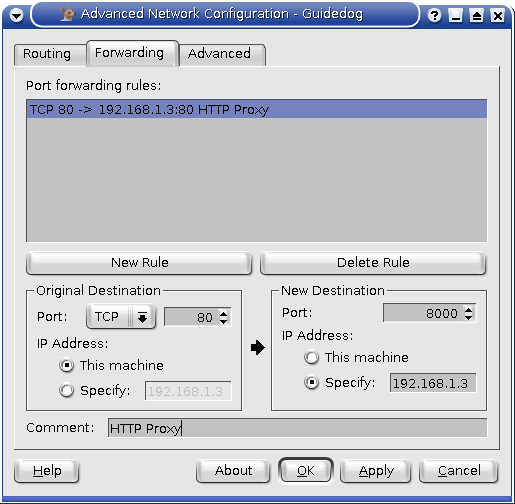 Guidedog is an advanced routing/network configuration utility for KDE 3 and 4 running on Linux 2.4 & 2.6 based machines. 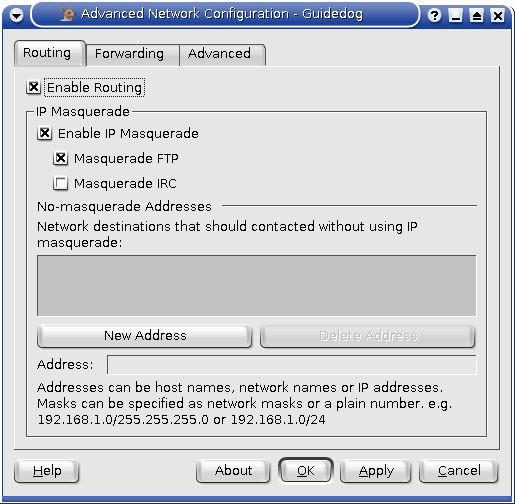 Using Guidedog you can easily activate packet routing/forwarding and also more advanced networking such as IP masquerade and Port Forwarding. Guidedog is intended to work along side any iptables based firewall, and as such compliments Guarddog nicely. You can read the Guidedog 1.0.0 manual here. Routing support (i.e. turning on IP forwarding/routing). Activating of NAT modules for FTP and IRC. WARNING: Using Guidedog can expose your network to outside attack if not used in conjunction with a proper firewall. I recommend Guarddog. Make sure you read the README file contained in the archive. - Ported to Python and KDE 4. - Only accepts numeric IP addresses or masks. No domain names. - More work on the manual. - Added "No-masquerade" address list. - Script no longer uses the 'sysctl' command. - Added /usr/local/sbin/ to the command search path. - Updated the admin dir, and made sure it compiles on KDE 2 and 3. (You will need a PNG format supporting browser to see these).